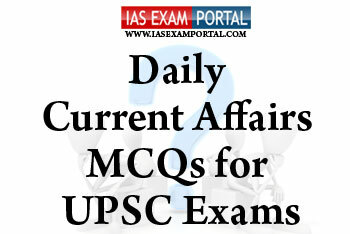 Current Affairs MCQ for UPSC Exams - 6 DECEMBER 2018 | IAS EXAM PORTAL - India's Largest Community for UPSC Exam Aspirants. 1) A SHC is meant to give each farmer soil nutrient status of his/her holding and advice him/her on the dosage of fertilizers and also the needed soil amendments, that s/he should apply to maintain soil health in the long run. 2) It will be made available once in a cycle of 3 years, which will indicate the status of soil health of a farmer’s holding for that particular period. 3) The soil sample will be tested as per the approved standards for all the agreed 12 parameters only at the State Testing Labs owned by the Department of Agriculture and by their own staff. Q2. Which of the following statements regarding the recently released draft “witness protection scheme” are true ? 1) The Witness Protection Scheme allows for various measures that must be undertaken in order to protect people who appear as witnesses in civil cases. 2) Some of the other protective measures include monitoring of mail and phone calls, change of phone number, installation of CCTV cameras at the witness's home and concealment of identity. 3) The types of protection measures envisaged under the scheme are to be applied in proportion to the threat and they are not expected to go on for infinite time, but are expected to be for a specific duration on need basis which is to be reviewed regularly. 1) Bamboos are perennial flowering plants in the grass family.Bamboo can grow on different altitudes and under various climate conditions, but it prefers tropical climate. 2) High sugar content content in bamboos make them vulnerable to pest infestation. 3) Bamboo releases 30% more oxygen into the atmosphere and absorbs more carbon dioxide compared to other plants. Because of these features, bamboo greatly decreases amount of greenhouse gases in the atmosphere and cleans the air. Which of the above statements aretrue ? a) It is used for geo-tagging of saplings and delineation of plantation boundaries under ongoing afforestation activities of NamamiGange programme. b) It is developed to collect information on various pollution sources that affects the water quality of river Ganga. c) to get detailed high resolution map and data of all relevant features of states through which ganga flows. d) to get datas collected from dams regarding basin depth and siltation of river ganga & its tributaries .